Nestle just outbid an Ontario town for the right to purchase a local well, risking the town’s long-term water security. Let’s stop Nestle from sucking Ontario dry to line their pockets! The small town of Centre Wellington tried to purchase a nearby well to ensure its future water supply was secure. But Nestle beat their offer. Now Nestle's waiting for approval from the government to start testing water quality and quantity -- so they can get to work profiting from their purchase. Ontario sells millions of litres of ground water every day to companies like Nestle, at incredibly favourable rates, letting them profit from what should be a public good. Just last month a severe drought made Premier Wynne promise to review the practice. And the same issue has cropped up in other provinces, including British Columbia. It's time for action! The bottled water industry in Ontario and elsewhere is essentially an economic favour to massive corporations paid for unknowingly by taxpayers -- and it's also an environmental disaster. Reports say that by 2050 there will be more plastic in our oceans than fish -- and companies like Nestle are a major source of the problem. Click to tell Nestle: hands off! Premier Wynne's government has already said provincial practices aren't in line with current reality. Let's not let this go on another day! You likely saw the news. On July 20, a pipeline ruptured near the Alberta-Saskatchewan border, spilling up to 250,000 litres of toxic crude oil into the North Saskatchewan River. As well as being home to countless birds, plants, and fish, this majestic river is the main source of drinking water for tens of thousands of families. In the middle of this hot summer, more than 50,000 people were suddenly thrust into a full-blown water crisis. Prince Albert in Saskatchewan and nearby First Nations had to declare a state of emergency. And it may take months to fully remove all of the thick oil residue from the river. Can you imagine if this were to happen to your family and your community? The sad reality is that disasters like this are now all too common. Waterways across Canada and Indigenous lands are increasingly being contaminated and put at unacceptable risk by leaking pipelines, toxic mines and dangerous fracking operations. Now consider that the controversial Energy East pipeline – under federal review at this very moment – would carry 1.1 million barrels of toxic tar sands bitumen every day from Alberta to the Bay of Fundy. If approved, Energy East would cross nearly 3,000 waterways and the source of drinking water for more than 5 million people. That is a risk that you and I simply cannot accept. Yet despite serious safety and environmental concerns, Prime Minister Trudeau and our new Liberal government continue to support Energy East and other controversial projects. And behind the scenes, industry lobbyists from Big Oil and mining are putting extreme pressure on our government to keep any new environmental laws watered-down. That’s why it would be a mistake for you and me to sit out the upcoming freshwater public consultations and trust that it will all work out. Only by coming together with passion and conviction, and in huge numbers, can we take on Big Oil and mining’s corporate lobbyists and give Prime Minister Trudeau a clear mandate from the people: It’s time to protect every lake and every river. 1. Produce and distribute new public education tools to get people informed from coast-to-coast-to-coast on how Canada’s current climate and water legislation, weakened or gutted altogether by Stephen Harper, is leaving our lakes, rivers and drinking water at serious risk. 2. Flood the public consultations by launching a national ad campaign to make sure everyone knows when and where the events are being held, and how to participate. 3. Keep the pressure on MPs on Parliament Hill and in their ridings to follow through on their election promise and deliver the 21st century water laws Canada needs now. As I write in Boiling Point, my new book on Canada’s growing water crisis, is time to abandon our erroneous beliefs that Canada has unlimited supplies of water, that Canadians have taken care of our water heritage or that we still have lots of time to do so. That could not be more wrong. If you agree that it’s time Canada enacts a strong, 21st century national policy that enforces water protection and promotes water justice, then please join me in this fight. Our path forward is clear, but not short or simple. This is our chance to finally undo the damage done by Stephen Harper and secure a better future for every lake and every river in this country. I can’t think of a more valuable gift we can give ourselves and our grandchildren than that. Ever since it took over PacRim in El Salvador in 2013, the large Canadian-Australian Mining Company, OceanaGold, has wanted to mine gold along the Lempa River in northern El Salvador. It claims that it will be an environmentally-responsible mining company that will protect this river, which supplies over half of the drinking water of El Salvador. OceanaGold currently runs another large gold mine half way around the world in the northern Philippines, which it also claims is a “responsible” mine. We visited this mine in Didipio, Nueva Vizcaya, Philippines, in 2013 and we have researched the mine. It is neither responsible nor sustainable, and it offers a glimpse of what El Salvador could face if it invites OceanaGold to mine. Displacement: Dozens of families, most of them migrant indigenous peoples, were forcibly and illegally displaced as their homes were demolished to build the mine. Violence: Two people opposed to the mine were murdered under suspicious conditions. These two findings alone convinced the Philippine Human Rights Commissioner to recommend in 2011 the revocation of OceanaGold’s mining license. Abusive Working Conditions: Workers in the mine earned less than 50 cents an hour in grueling 12 hour shifts. Toxic Chemicals: As would be the case in El Salvador, OceanaGold uses the toxic chemical cyanide to separate the gold from the surrounding rock, a chemical that can get released into the soil and rivers in the heavy rains that come in rainy season. In 2012, the company closed down a road used by farmers to transport their crops to market and flooded it to be used as a toxic mine tailings dam. Water Pollution: Farmers downstream from the mine have experienced skin rashes, and dead fish washing up on the shores. Noise Pollution: Residents near the mine complained that they often couldn’t sleep at night because of the loud noise of the machinery that runs all day and night. Air Pollution: More than a thousand residents have suffered respiratory diseases. Export of Profits: The overwhelming majority of OceanaGold’s profits leave the country along with the gold. Overuse of Water: A more recent fact-finding delegation found that water for irrigation near the mine was drying up because of the huge amounts of water used in the mining. Several communities have had to abandon their homes because the drinking water has dried up. Because of this, in June 2016, communities blockaded the road into this Philippine mine to prevent OceanaGold from bringing in equipment to expand the mine. In May, Filipinos elected a new President, who appointed a new Minister of Environment and Natural Resources in June: Gina Lopez. She has announced a halt on new mining in the country. This places the Philippines alongside El Salvador, Costa Rica, Panama, Colombia, and Argentina, as nations that are putting the environment and water over the profits of mining firms. Site C Dam is a proposed 60-metre high, 1,050m length dam on the Peace River on Treaty 8 territory in northeastern British Columbia (see image below), a project that if built, would create an 83km reservoir submerging 78 First Nations heritage sites in violation of the Constitution Act, but how does it connect to continental water diversion? To date, much has been said in the media regarding the issue of Site C Dam, but very little has touched on the matter of NAFTA and water.The spin behind the necessity of the project has largely concentrated on exaggerated claims of the energy needs of Vancouver, to the BC Liberals’ power requirements for the LNG and Fracking industry, to providing below-market value energy to Alberta in exchange for agreeing to their pipelines. Recently, the Justin Trudeau Government approved two additional permits for Site C Dam despite recommendations against the project by the Royal Society of Canada and 250 of Canada’s top scientists on the basis that Site C Dam is an ecological catastrophe and gross violation of rights under the United Nations Declaration of Indigenous Rights and violates our own Constitution. Little, however, has been noted by the media about the NAWAPA (North America Water Power Alliance) connection to Site C Dam, and that is something all Canadians should be seriously concerned about. NAWAPA is a continental water diversion plan drafted by the US Army Corps of Engineers during the 1950s -1960s. Essentially the plan involved diverting (stealing) water from Canada via the Rocky Mountain Trench to Southern California. The rivers of Canada in British Columbia and the Yukon were an integral part of this plan. Roland P. Kelly argues “Since the water resources of the continent were placed by nature without regard to political boundaries, it seems logical…to figure out a distribution system maximizing these resources without regard to these boundaries”(31). Obviously, the implications of this project would have devastating environmental and human impacts, in addition the destruction of eco-systems and diversion of water would serve as an accelerant to climate change. With regard to the Site C Dam, it is worth noting that the proposed dam site falls directly on the lines drawn in the original NAWAPA plans. Site C and the Columbia River Project are integral to the implementation of NAWAPA, thus calling into question the nature of the project in relationship to continental water diversion plans. It is of the upmost importance to note that, once impounded behind the dam, the Peace River is subject to NAFTA as a water commodity, thus putting the people of Canada at risk of loosing water rights if privatization of BC Hydro occurs. One might reasonably question BC Hydro’s managed fiscal state of ‘$18.1 billion in approximate debt’ as being a primer for manufactured privatization to occur. The only potentially saving factor in the political manoeuvring behind Site C and Continental Water Sharing is the fact that the Province of British Columbia is located on un-ceded territory. The Governments’ title to water is, therefore, invalid and any quiet agreements made by our politicians with regard to NAWAPA would not be recognized under International Law despite corporate interests involved. The law must be the personal concern of every citizen, to uphold for our neighbours as well as for ourselves. What does it say if the Government of Canada is found in violation of section 35(1) of the Constitution Act, the UN Declaration on the Rights of Indigenous People and recently the violation of the Wildlife Act? It is time for people to start asking questions, who is benefitting from this project and what is going on behind the scenes? Palestinian officials accuse Israel of cutting water supplies, but Israel points to shortages and burst water pipe. Israel's national water company has cut crucial water supplies to large areas of the occupied West Bank, leaving tens of thousands of Palestinians without access to safe drinking water during the Islamic holy month of Ramadan, Palestinian officials said. Mekorot, the main supplier of water to Palestinian towns and cities, siphoned off water supplies to the municipality of Jenin, several Nablus villages and the city of Salfit and its surrounding villages. Ayman Rabi, the executive director of the Palestinian Hydrology Group, told Al Jazeera on Tuesday that in some areas people had not received water for more than 40 days. "People are relying on purchasing water from water trucks or finding it from alternative sources such as springs and other filling points in their vicinity," he said. "Families are having to live on two, three or 10 litres per capita per day," he said, adding that in some areas they had started rationing water. The city of Jenin, which has a population of more than 40,000 people, said its water supplies had been cut by half, and warned that it would hold Mekorot solely responsible for any tragedies resulting from water shortages during the hot summer months. Israel's national water company, Mekorot, denied cutting the water supplies, saying there was only broad reduction in water supply to the Palestinian territory. "As a result of the shortage of water supply in the West Bank... we have made a broad reduction of the supply to all residents in the area," Mekorot told Al Jazeera late on Wednesday. "All the facilities are working and the capability to supply is less than the rate of consumption. The water authority recently approved a master plan for the water sector and accordingly we will build the systems that will meet the West Bank's required consumption," the company added. Israel's COGAT agency, which regulates the occupation in the West Bank, also pointed to a burst pipe, which was said to have disrupted supplies to the villages of Marda, Biddya, Jamma'in, Salfit and Tapuach. "The water flow has been regulated and is currently up and running," COGAT told Al Jazeera. According to the UN, 7.5 litres per person per day is the minimum requirement for most people under most conditions but in some areas of Palestine - where temperatures exceed 35C - the minimum requirement is much higher. Israelis, including settlers, consume five times more water than Palestinians in the West Bank, 350 litres per person per day in Israel compared with 60 litres per Palestinian per day in the West Bank. Ya han sido las distintas reacciones ante el desalojo forzado y agresivo por parte de agentes de la policía nacional al pueblo indígena Ngäbé el martes 24 de mayo, cuya orden obedece al Gobierno Nacional. Y que los indígenas en justa razón manifestada y pactada, nunca debió darse dicha acción, ya que se mantenía un dialogo, y que unos de sus puntos era no llenar la represa hidroeléctrica Barro Blanco construida por la empresa Generadora del Istmo S.A (GENISA) sobre el río Tabasará. En enero pasado el río Sambingo, ubicado en el departamento del Cauca, al suroeste de Colombia desapareció, consecuencia del vertimiento de mercurio y cianuro por la minería. La policía colombiana detuvo este miércoles a 14 personas por su presunta participación en la minería ilegal en la región. Lo que señalan las autoridades, es que este grupo son “los responsables de secar el río Sambingo”. “Se estima, que los criminales, percibían cerca de 3 mil millones de pesos mensuales producto de sus acciones ilegales”, indicó el Ejército. Today we look at yet another case of corporate interest versus the protection of public health and the environment. Australian mining company Oceana Gold are suing one of the poorest countries in the world, El Salvador for $300 million after an application to operate a gold mine at the head of the countries' biggest river was rejected in order to protect the countries scarce drinking water. As one of the longest running ISDS cases, after almost seven years the World Bank has still not released a verdict. To give us more detail on the case and tell us about how Australia could face similar cases if the recently signed TPP agreement gets passed by parliament this year is Kevin Bracken from the Maritime Union of Australia. We will also hear and interview with Santos Aguilera at a protest at Oceana Gold offices on Friday 26th February and some excerpts of the speeches made. 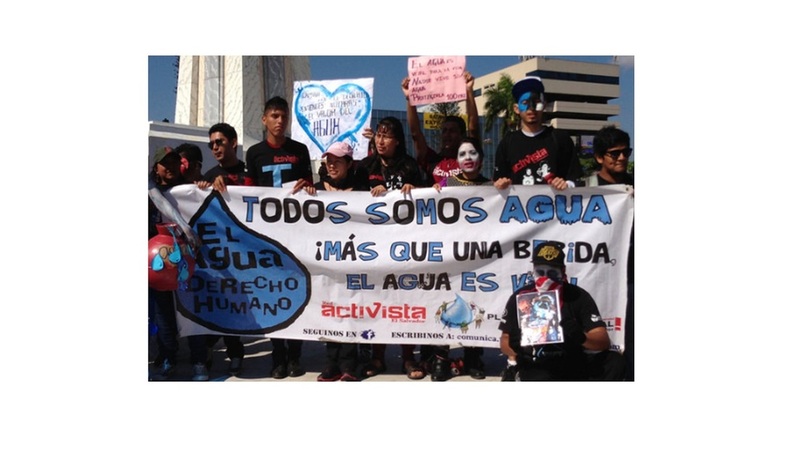 Trabajadores, dirigentes sociales y pobladores de distintos distritos se movilizaron al Ministerio de Vivienda y ProInversión en Marcha por el Agua. Trabajadores de Sedapal, dirigentes sindicales y vecinos de distintos distritos de Lima, marcharon hoy por las calles del Cercado de Lima en contra de lo que consideran pretensión del gobierno de privatizar esa empresa del agua potable. El secretario general de la Federación de Trabajadores del Agua Potable y Alcantarillado del Perú (Fentap), Luis Isarra, señaló que diversas organizaciones salieron a las calles para decirle al gobierno que no están de acuerdo con la privatización de Sedapal y de 48 empresas del agua de todo el país. “La jornada empezó en el Campo de Marte a las 9 de la mañana y a las 10 de la mañana comenzó la marcha al Ministerio de Vivienda, Construcción y Saneamiento y a Proinversión. A cuatro meses de irse, este gobierno insiste en privatizar Sedapal”, dijo el dirigente. Sobre el reciente Decreto Legislativo 1240 emitido por el Ejecutivo, Isarra dijo que es totalmente anticonstitucional y emitido al amparo de las facultades que le da el Congreso de la República al gobierno para legislar en materia de seguridad y economía. “Sin embargo, abusando de estas facultades y por encima de la Constitución, se promulga este decreto legislativo. Nosotros hemos recogido firmas en el transcurso de la multitudinaria marcha para presentar una demanda de inconstitucionalidad del decreto en cuestión”, dijo Isarra. Agregó que actualmente hay dos proyectos de ley en el Congreso pidiendo la derogatoria del D.L 1240, uno presentado por la congresista Natalie Condori y el otro por el parlamentario Justiniano Apaza. Según Luisa Eyzaguirre Contreras, secretaria general del Sindicato Único de Trabajadores de Sedapal (Sutesal), el gobierno ha emitido fichas técnicas y normas legales, encubiertas como asociaciones público-privadas, pero que en realidad significan la privatización del agua. Según la dirigente Eyzaguirre, los ministerios de Economía y de Vivienda, el Fondo Nacional de Financiamiento de la Actividad Empresarial del Estado (Fonafe) y ProInversión son agentes de este acuerdo que planea concesionar Sedapal por 30 años. ​Los días 3 y 4 de octubre de 2015, nos dimos cita en el enigmático, hermoso y olvidado departamento de La Guajira, hombres, mujeres y niños/as provenientes de diversas partes del país y del mundo, para acompañar a las comunidades indígenas, afrodescendientes y campesinas que desarrollaron el Tribunal Popular contra las Transnacionales en La Guajira. ​Las comunidades del departamento, cansadas ya de tantos años de violaciones contra sus derechos levantaron la voz y decidieron hablar sobre todos los atropellos de los que han sido víctimas por parte de la transnacional Cerrejón, “dueña” de una de las minas de carbón a cielo abierto más grandes en América. A surprise five-minute rain shower falls like a taunt over the scorched riverbed of the Ranchería river: fat raindrops spatter in the dust but evaporate almost immediately. Nearby, a young girl and boy scoop out a bowlful of cloudy groundwater from a makeshift well to wash a few scraps of clothes. The Ranchería river has run dry after three years of intense drought, decades of overuse and a lifetime of public corruption in the province of La Guajira, one of Colombia’s poorest and most forgotten regions. Crops have long ago shrivelled, babies are dying of malnutrition and livestock are wasting away from thirst. As the world looks for innovative solutions to solve the rapidly worsening water crisis, two Salvadoran experts are touring Canada this week to promote a simple strategy that could save the public billions of dollars. Yanira Cortez, Deputy Attorney for the Environment for El Salvador's Human Rights Ombudsperson's Office and Marcos Gálvez, President of the Association for the Development of El Salvador are calling on Canadians to help solve the water crisis by challenging investor-state dispute settlement (ISDS) mechanisms that have enabled corporations to sue governments for hundreds of millions of dollars when policies aimed at protecting the environment threaten corporate profits. Read More here .... and Here! Requieren la apertura inmediata de las compuertas de la represa para la población y que la industria utilice otras fuentes públicas de agua, como las subterráneas.Por igual motivo, más de la mitad de ellos ni siquiera son inscriptos en el registro civil al nacer, tampoco generan declaraciones de óbito, al fallecer. Lo que imposibilita al gobierno obtener estadísticas reales de la situación en La Guajira.